As the news come in about yet another Toyota recall, this time involving the 2010 Prius (Japan only so far), it starts to look very much like the issue is not the mere 1.5″ long piece of metal pictured here. I honestly don’t know what is more embarrassing in terms of PR for Toyota: admit to improperly designing a pedal or letting a bug slip into the software that runs their vehicles. C’mon Toyota, a pedal that gets jammed? You guys can do better than that. If you spent any time at all on this blog, you obviously already know that I am a proud Toyota Prius owner myself and would not trade it in for any other car despite the current Toyota troubles. Every car, new or used, I ever had was having some problems except for the two Priuses I’ve had so far. But then, again, I don’t have a third generation Prius. However, it looks to me that the “metal shim solution” is more psychological than real. For someone who knows nothing about cars OR software it is so much easier to wrap their head around a solution that requires a piece of metal than one that requires a firmware update. People would not only mistrust firmware updates because nothing tangible is being added but they will be absolutely correct to suspect it – how many times have we all seen firmware updates that were actually detrimental to the operation of the unit being updated. 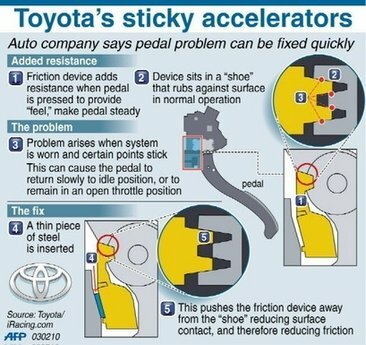 So, if Toyota said:”we’ve found the fix and it’s a 1.5″ long piece of metal” it would sound more like a solution to most people than if they said:”we’ve found the fix and it’s in a software subroutine we’ve purchased with the development kit for one of the chips that controls the fuel injection system”. If someone really wants to find out what it was (when the dust settles), watch the stock prices of Intel, AMD, Freescale, Microchip, Atmel and other micro controller manufacturers. I bet you’ll be able to back-track a dip in stock price in early 2010 to one of their chips used in Toyotas. That will be your answer, not the mere 1.5″ long piece of metal. One other thing, too: I don’t think we’ve seen the last car firmware trouble. We are just entering the era of car firmware bugs, possibly even some malware thrown in for fun or corporate sabotage every once in a while. I also firmly believe that no manufacturer is safe from a software bug potentially slipping into its cars’ electronics and there guaranteed to be visible and embarrassing cases involving people dying as a result of a bug in some manufacturer’s fly-by-wire system. Let us just not forget that far more people will be saved by cars that engage brakes automatically in case of eminent collision or by cars that can compensate for steering errors to keep cars from skidding off the road. Progress with something as difficult as a fragile human being packed in a tin can on wheels will always be messy and, sadly, tragic accidents will always serve as the best springboard for innovations and new safety measures. But us far as the trouble de jour for Toyota, I wish they came out and said it was a bug in the software. I’ve been writing software and making bugs in the process for my entire life. I would absolutely understand. This entry was posted on Friday, February 5th, 2010 at 6:17 pm	and is filed under Toyota Prius. You can follow any responses to this entry through the RSS 2.0 feed. You can leave a response, or trackback from your own site. Biased Blogging: What’s Up with That?